Many dismiss the ministry, experience and contributions of A. A. Allen because of his latter years–which were filled with increasingly suspicious behavior. But, whatever your opinion may be, few doubt the effectiveness of his early ministry. Since his death, the two books that told the story of Allen’s personal quest to demonstrate God’s power have been out of print and VERY difficult to find. These two inspirational resources are now available from John Carver Ministries. The Life of A. A. Allen: As Told by A. 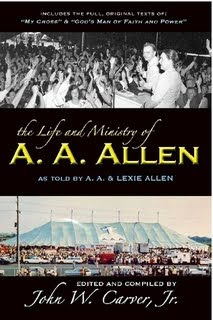 A. and Lexie Allen contains Allen’s autobiography, “My Cross” (which details his personal quest for supernatural ministry) along with his wife’s biography, “God’s Man of Faith and Power”; these are reprinted with bonus material including rare photos and a recently discovered epilogue written by Allen just two years before his death. This book will find a welcome place in the hands of anyone who longs for God’s power in their ministry. It will also fill a void in many historical libraries. Foreword is by noted Pentecostal/Healing scholar Dr. David Edwin Harrell. This entry was posted in Books/Resources, Divine Healing, Pentecostal History, Spiritual Leadership. Bookmark the permalink. One Response to Rare Pentecostal/ Healing Books Available Again!